One of the buildings of KNU. One of the side benefits of “deployment” is being able to see and experience different countries and cultures. Another “plus” for me is getting to interact with nationals who are in my denomination in another country. 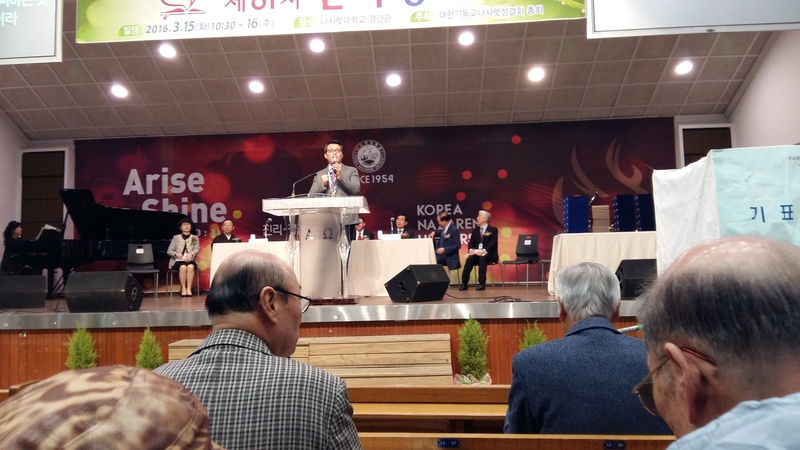 I had that opportunity yesterday when I was able to attend the district assembly of the Korea National District of the Church of the Nazarene at Korea Nazarene University (KNU) in Cheonan, South Korea. 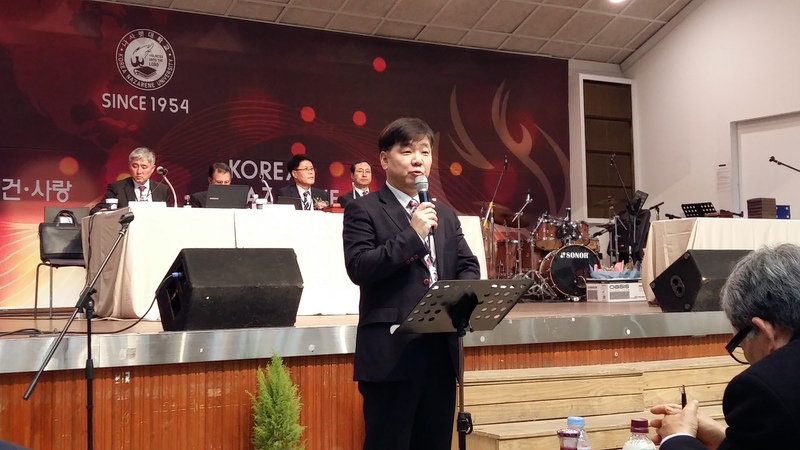 District assemblies are held annually by each district in the Church of the Nazarene and is presided over by one of the 6 general superintendents. 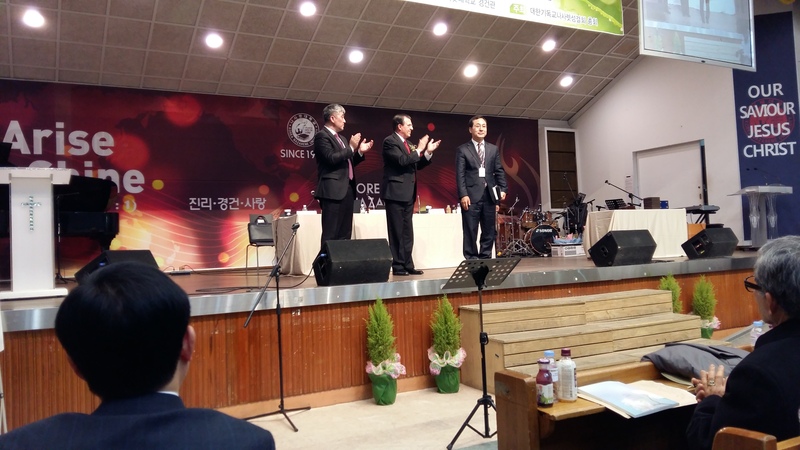 This year, the presiding general superintendent for Korea was David W. Graves, who I already know from several assemblies and other services in the U.S. Dr. Graves and I have a further connection in that his father (Harold Graves) was the District Superintendent on the Southwestern Ohio District where I grew up and received my first District Minister’s License. Attending the district assembly and experiencing the welcome and hospitality given me was an extreme honor and at the same time humbling. By the way I was treated, one would think that I was really “somebody” while I was the one being blessed and encouraged! 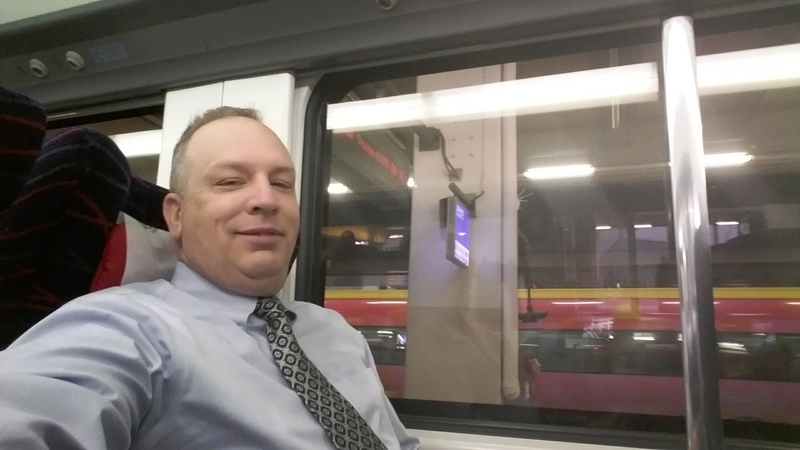 Traveling on the ITX to KNU at Cheonan. To drive to Cheonan, the location of KNU, would take over 2 hours, so I took the Intercity Train Express (ITX) from Yongsan Station. The public transportation in Korea is unbelievable. You can get just about anywhere in Korea in some combination of train, subway or bus, not to mention the thousands of taxis always available about anywhere you are. 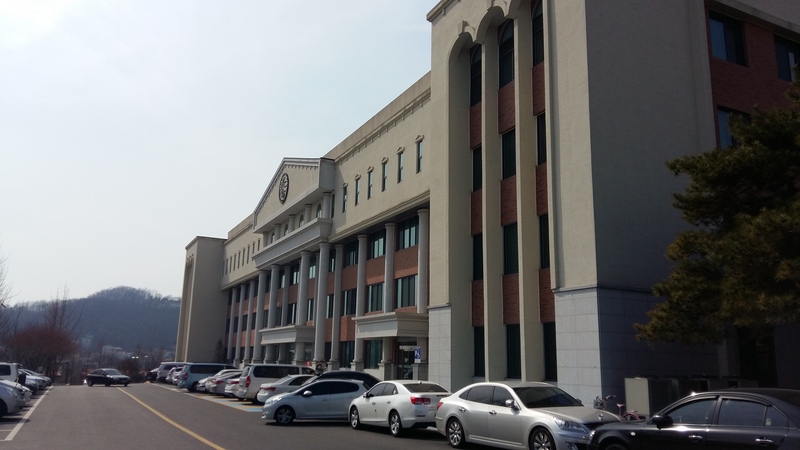 Depending on the station you use, you can get a Korea Train Express (KTX) from Seoul to Cheonan that takes just about 30 minutes and 20,000 won or an ITX that takes about an hour for just 9,000 won. The subway is much cheaper, but also makes a lot of stops so takes a lot longer. The subway is often better than driving, but may not be a time-saver. 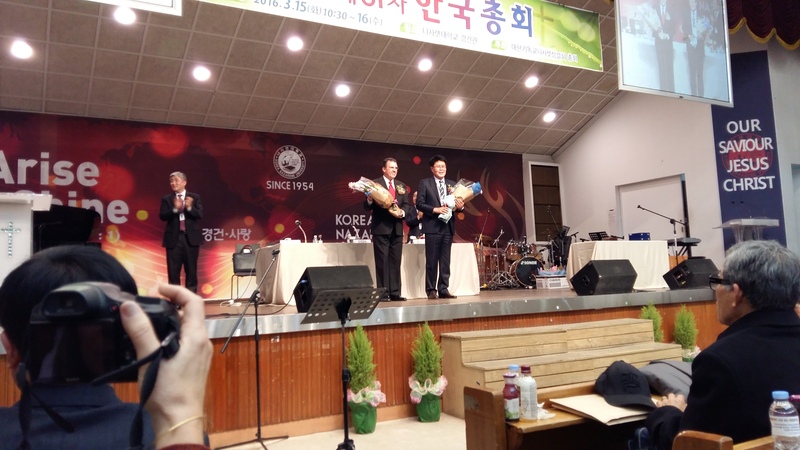 Once I arrived at the Cheonan Station, I was going to take a taxi to KNU but my first Korean national/Nazarene pastor friend offered to arrange for a pastor in Cheonan to pick me up at the station which saved me some time and a few thousand won. 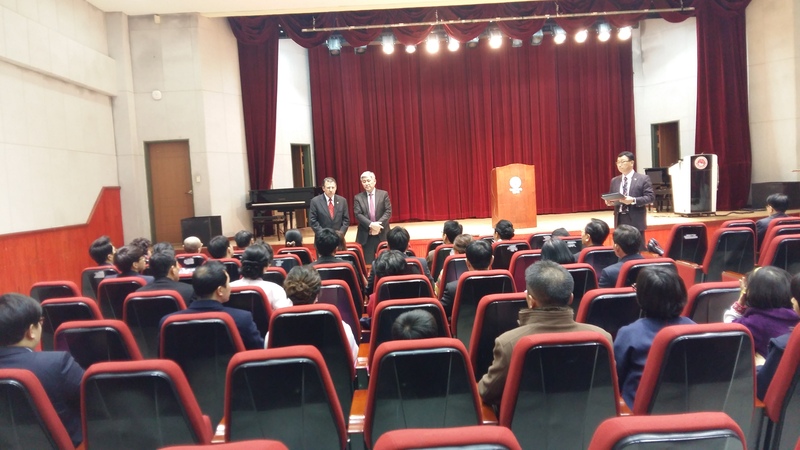 When we arrived at KNU, I expected to be directed to the auditorium where the assembly would be taking place and grab a seat in the back, but instead I was escorted to a conference room where the district leaders and other VIPs were gathering awaiting the arrival of the General Superintendent and start of the district assembly. Once everyone had arrived, we were all led to the auditorium where I was given a seat up front as the pre-service singing had already begun. Once I was moved to a better seat (with assembly VIPs) and given headphones to hear the interpretation, the service was underway. I’ll post most of the other pictures with brief descriptions under each one. Representatives from several sister holiness denominations attended and shared greetings and encouragement to the assembly. 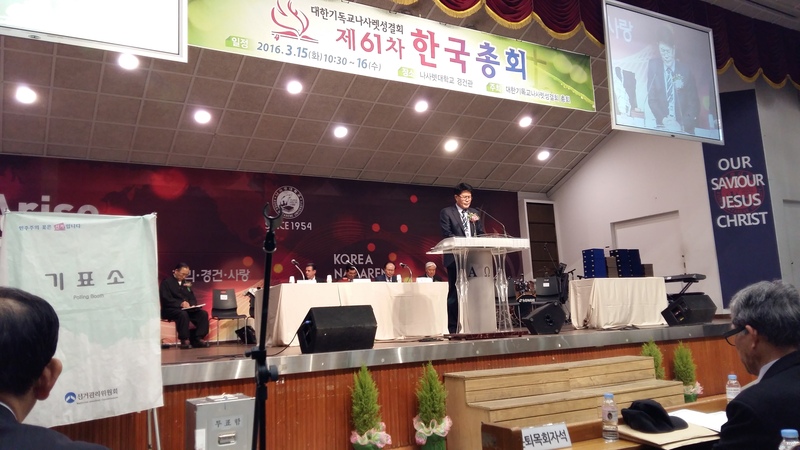 The head of the Union of Korean Churches shared greetings and encouragement to the assembly. 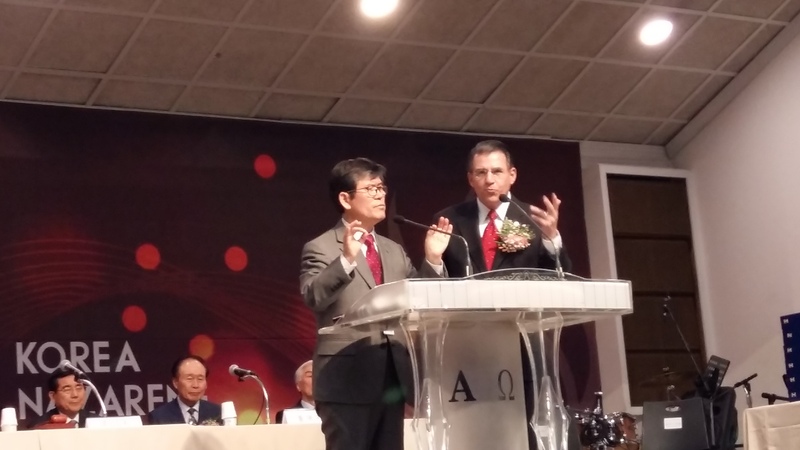 General Superintendent, Dr. David Graves, addresses the assembly with the aid of an interpreter. The current (out-going) district superintendent opening the assembly with prayer. 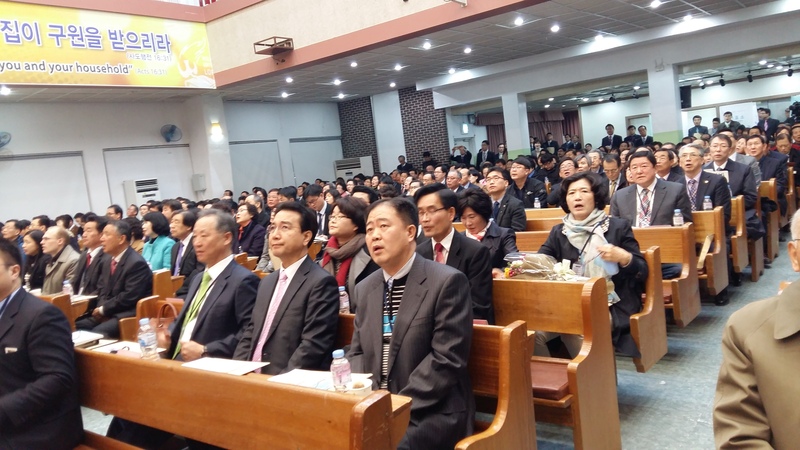 It was a full house in the assembly hall. 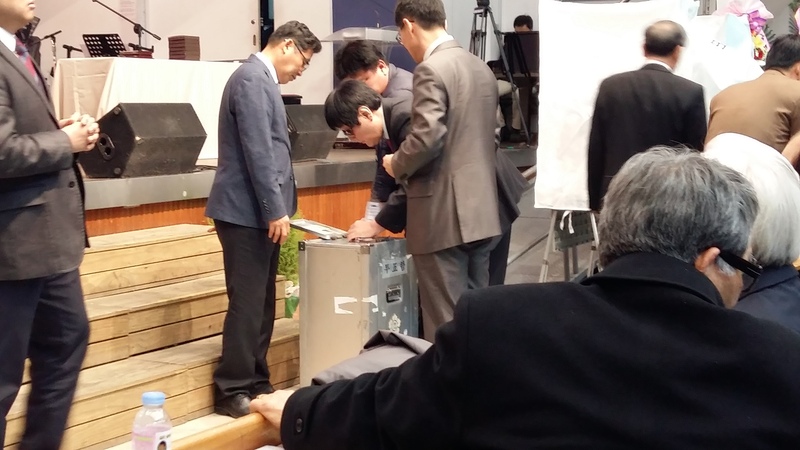 …then putting the ballots in sealed ballot boxes which were taken to the counting room by the board of tellers. The introduction of the newly-elected district superintendent (right). 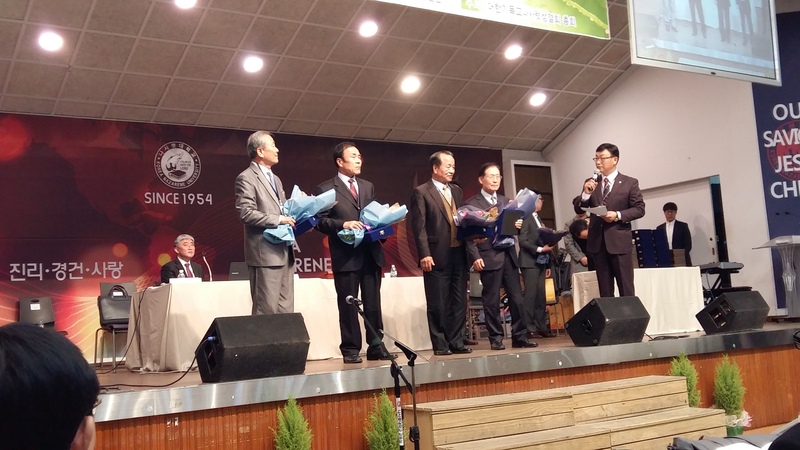 Retiring pastors recognized for their years of ministry. 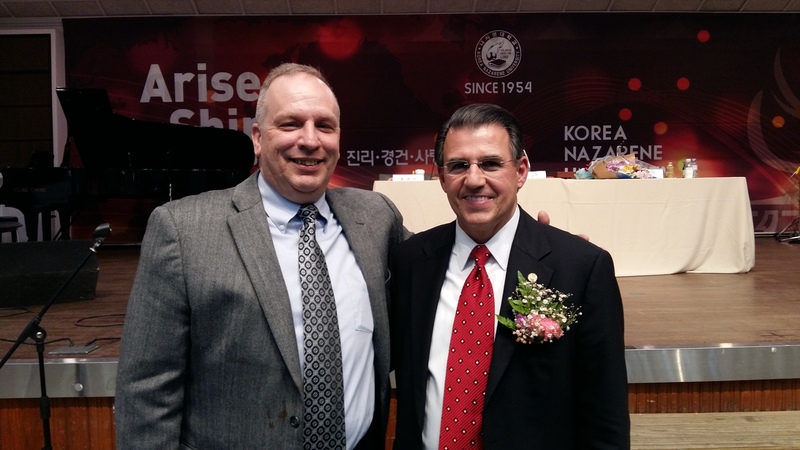 Pastors recognized for 30 years of ministry. 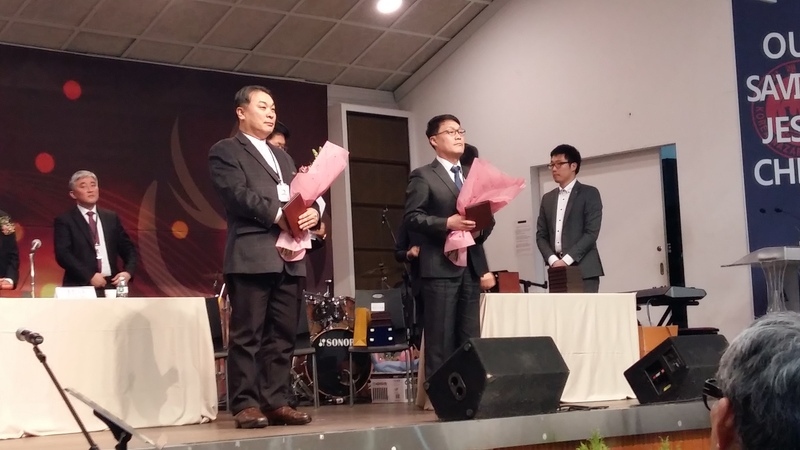 Pastors of the 2 churches officially organized this year. Pastor Kim recognizing Sunday School teachers for multiple years of service. The KNU Cafeteria where I, as part of the GS entourage, was provided lunch. The lunch we were given at the KNU Cafeteria. Some of it was good…some of it requires an acquired taste. The soup was yet to come but was way too hot for me to eat. The District & General Superintendents thanked with flowers. 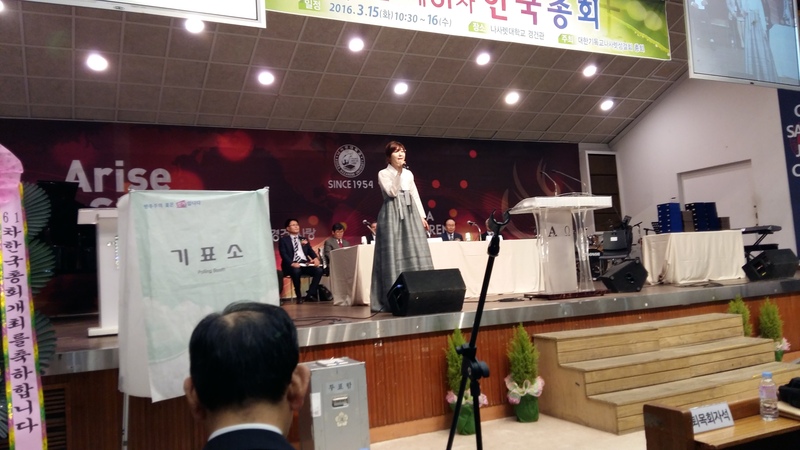 Korea Christian Television Service covered the district assembly. Here they are interviewing the newly-elected district superintendent. 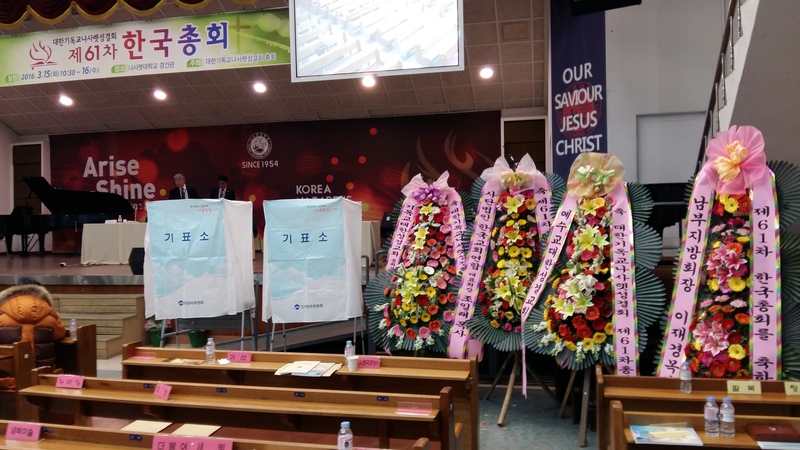 Not sure about these flower arrangements or what they say, but there were several at the front of the auditorium (2 of the voting booths are on the left). Following dinner with Dr. & Mrs. Graves, Mark Louw (the Asia-Pacific Regional Director) & his wife and daughter and several district leaders, at a really good western-style restaurant (I was really ready for a good steak!) 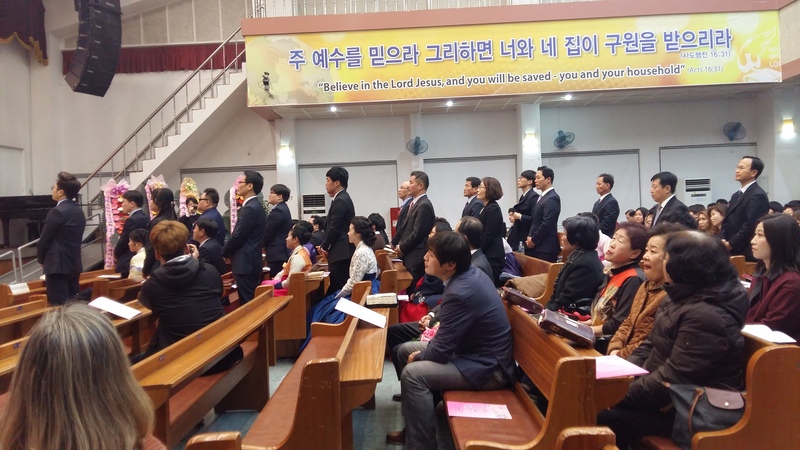 we returned to KNU for the ordination service where 14 ministers were ordained and 1 was recognized from another denomination. 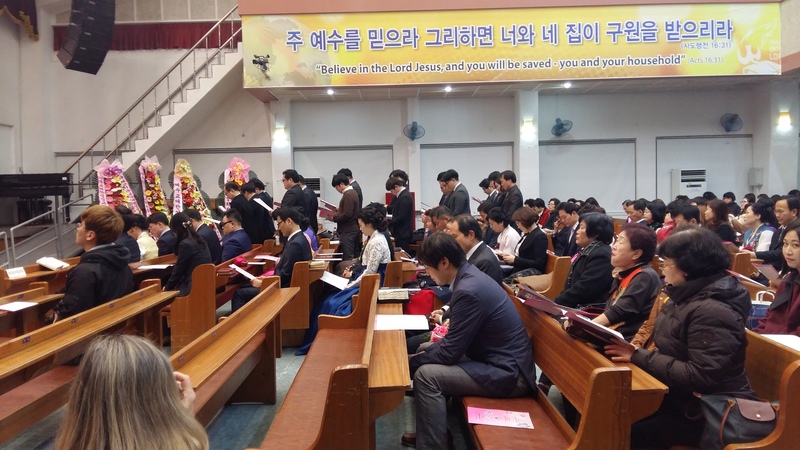 Beyond the thrill of being part of a service of Nazarenes in a country so distant from mine, the joy of watching future leaders of the International Church of the Nazarene enter into the ordained ministry was great. Here are some pictures from the this night. 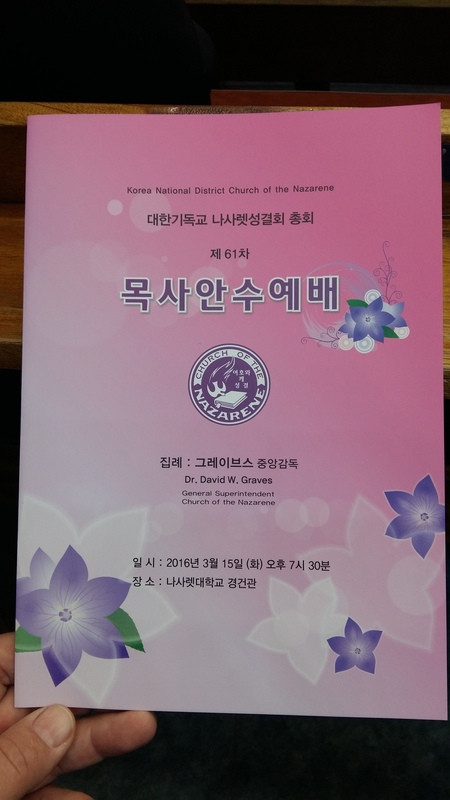 The program for the ordination service. I could just read a very little bit of it. 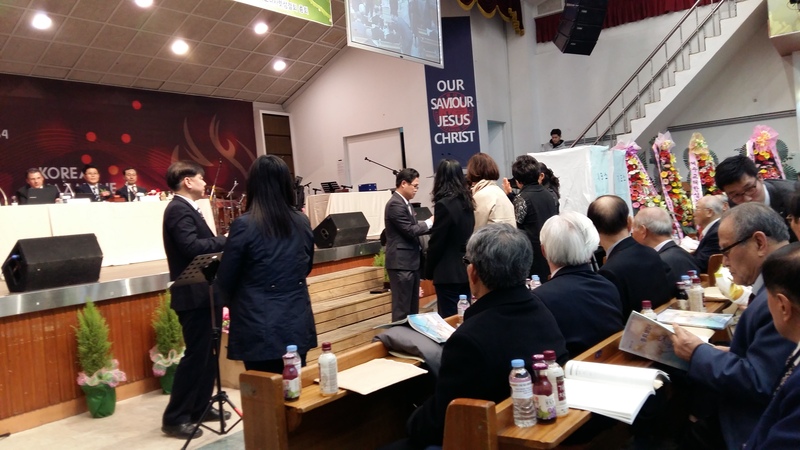 Before the service, the GS met with the ordinands and their spouses. His words of encouragement to them also encouraged and inspired me! 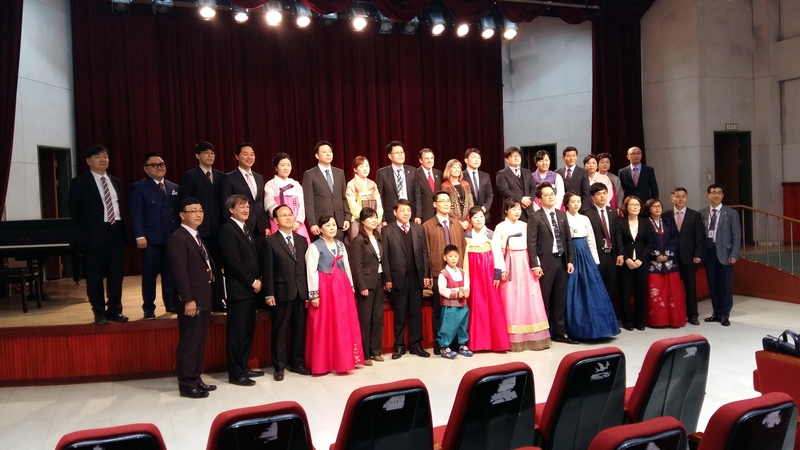 Before moving to the auditorium where the ordination service was held, the ordinands, their spouses (and some of their children) and the district and denominational leaders posed for a picture. 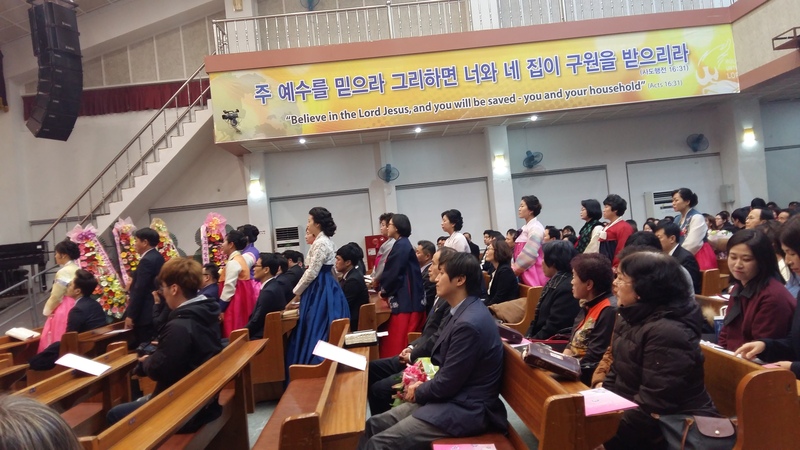 Notice that many of the spouses wore traditional Korean dress. 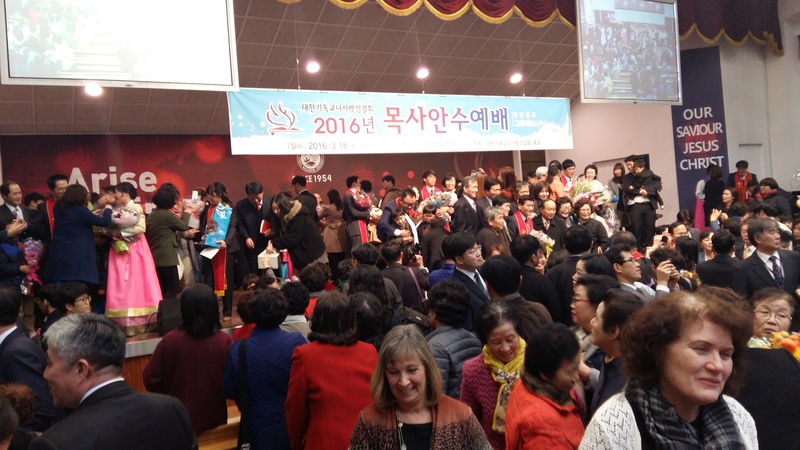 Each of the ordinands and their spouses were introduced to the gathered assembly. 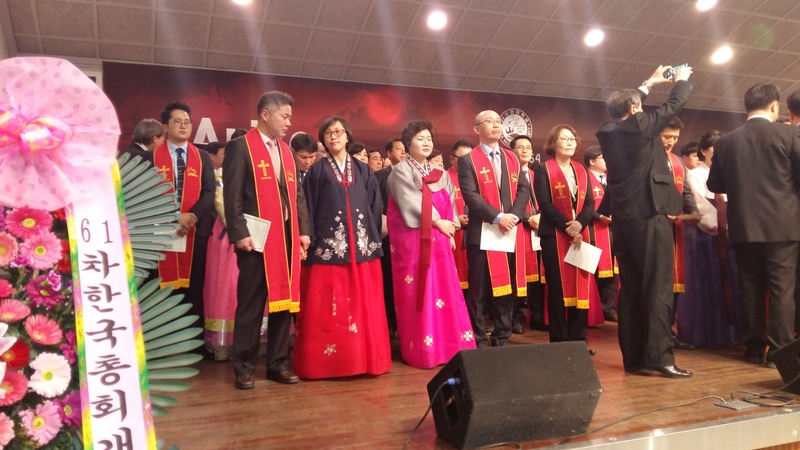 The ordinands were asked to stand and were given a charge from Dr. Graves. 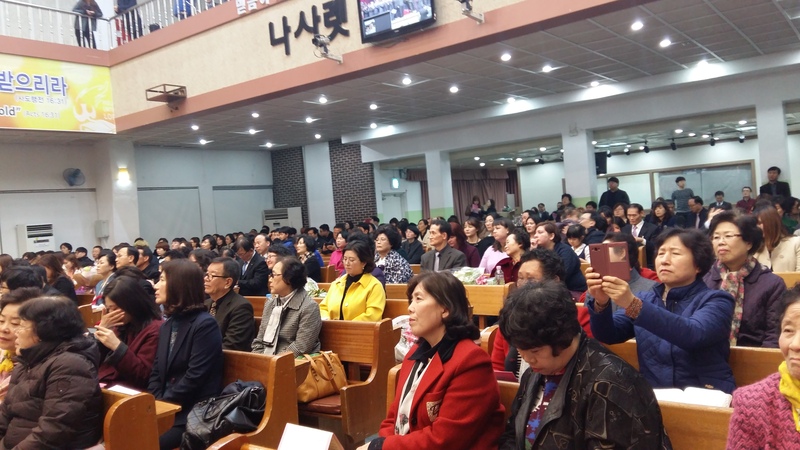 After the ordinands, the spouses stood while given a moving charge and inspiration to minister along side their spouses. 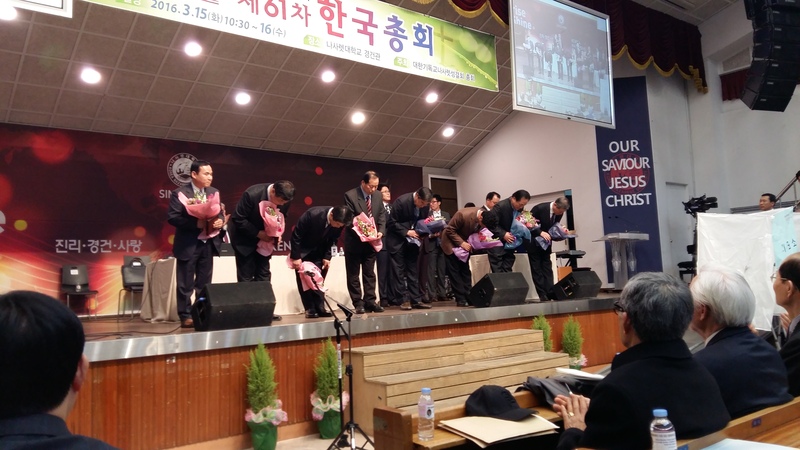 The district superintendent recognized and prayed for the ministers receiving their District Minister’s LIcenses. 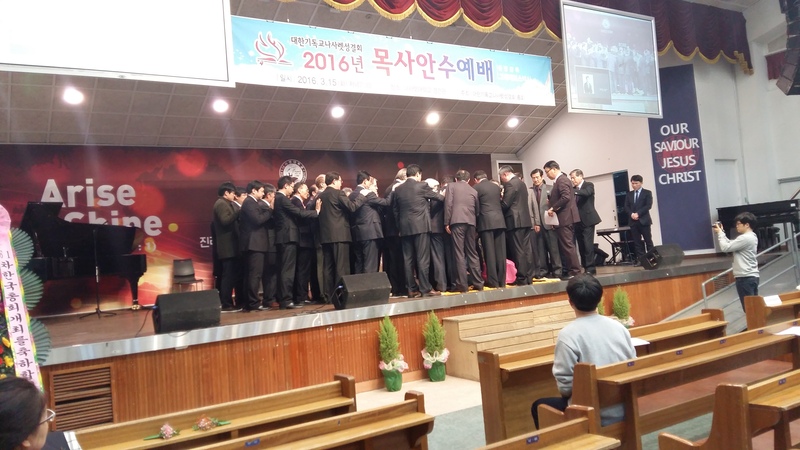 One by one, the ordiands and their spouses knelt on the platform, were prayed for, and ordained by Dr. Graves as the elders of the district laid hands on them. This is one of the most moving parts of the service and most of the ordinands and their spouses stood up, noticeably moved. Many family members and friends attended the service. After all were ordained, they all came up to the platform and received their ordination certificates and stoles. 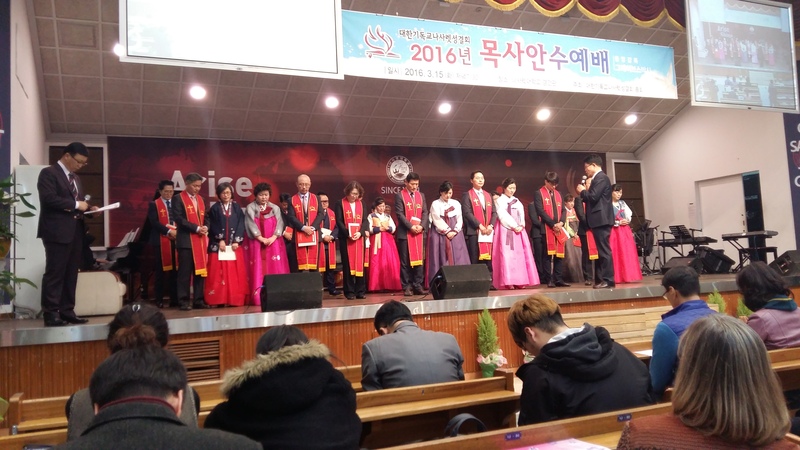 The district superintendent prayed a final prayer for the newly ordained ministers and their spouses. 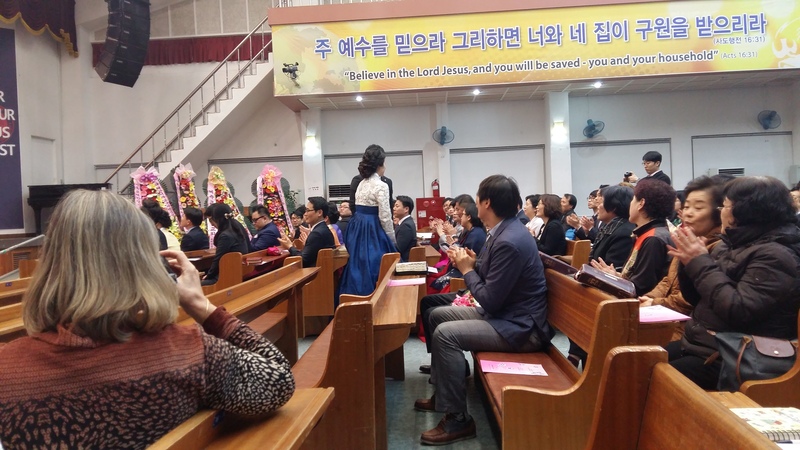 After the service ended, family members and friends swarmed the platform to offer congratulations, flowers and other gifts…and to take more pictures. I think that I was a bit of a novelty at the district assembly, not only as an American but as an Army chaplain. Several people asked to have a picture taken with them and I asked a few, too. Below are some of those pictures with a bit of description (as best as I can remember). I already mentioned my relationship with Dr. Graves. It was great to see him again! 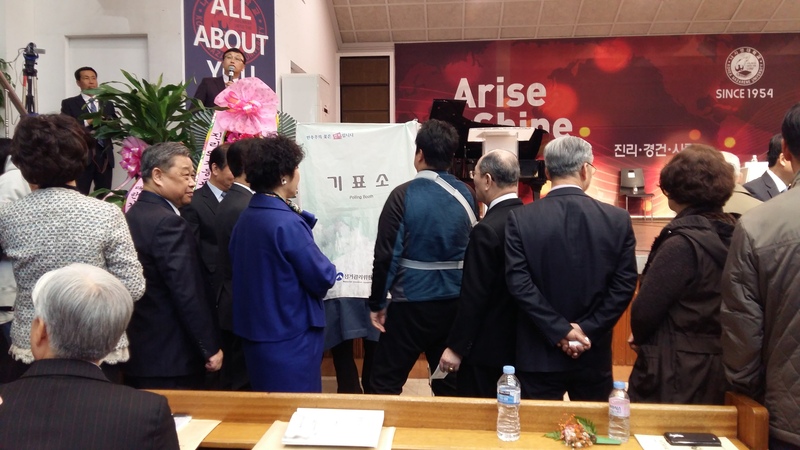 In this picture is Pastor Tak Kyung Sung, pastor of the Eoulrim church (right). 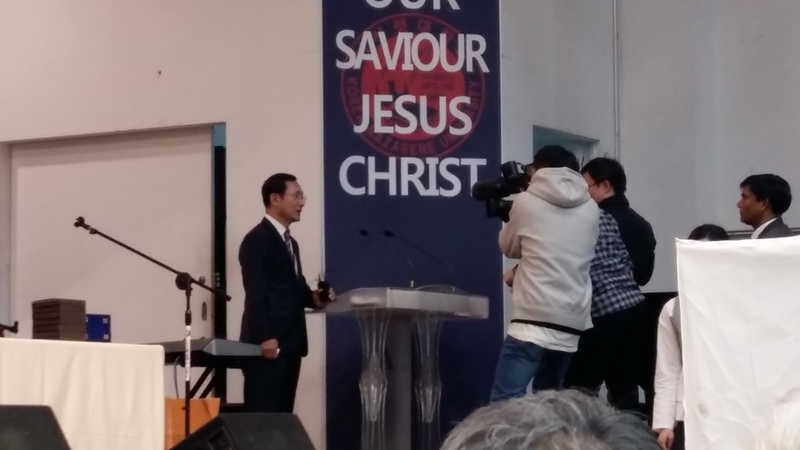 He invited me to come to his church to speak. 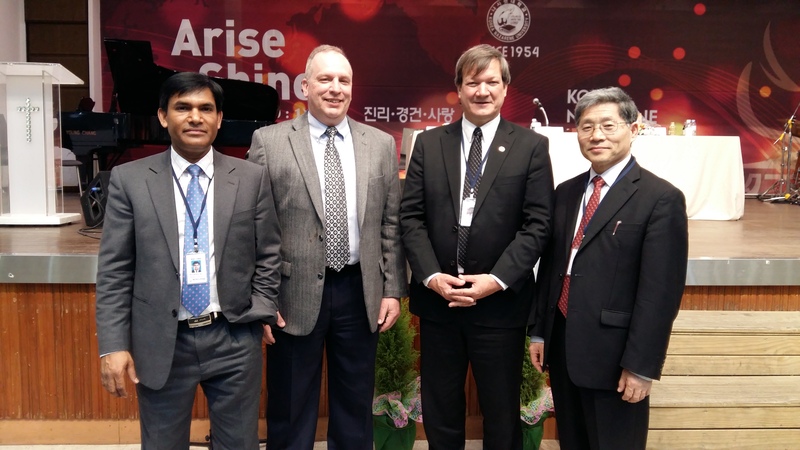 Next to him (2nd from right) is Mark Louw, the Asia-Pacific Regional Director for the Church of the Nazarene. 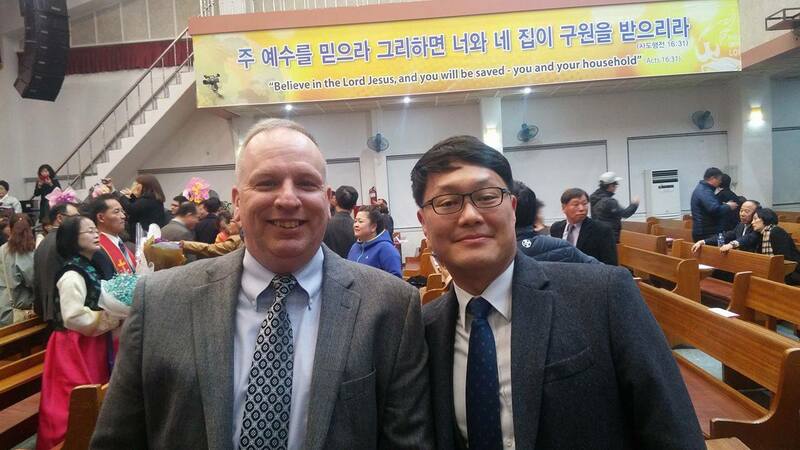 On the left is Bashir Gill Asim, from Pakistan, who works at KNU and attends Pastor Tak’s church. He told me he’ll be the interpreter when I come to speak. 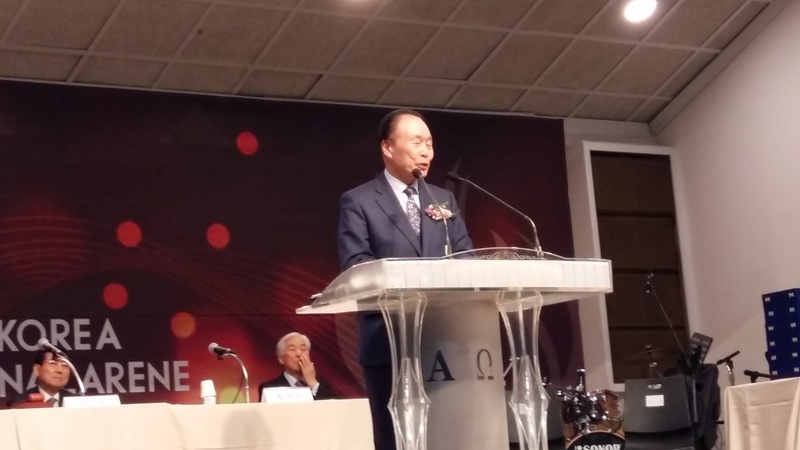 This is Pastor Chang Sun Hwang. 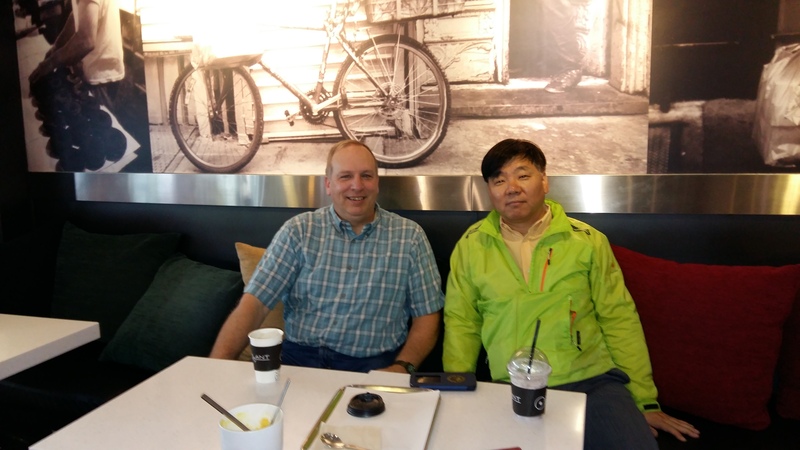 He is one of the pastors whose church was officially organized this year and is the one who picked me up from the Cheonan train station. 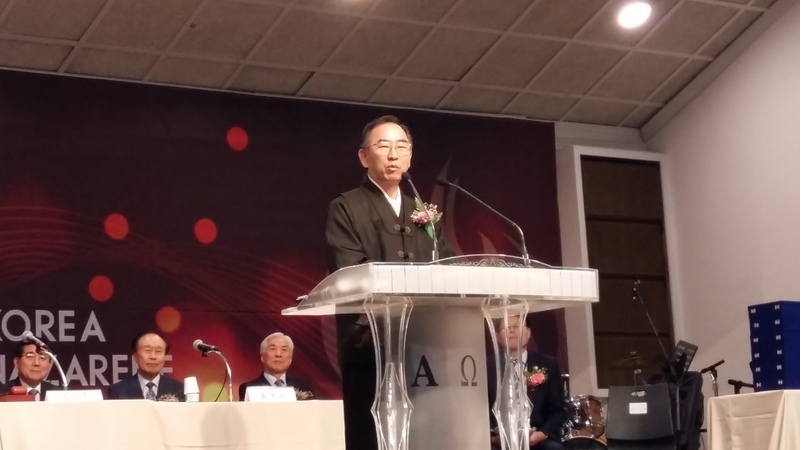 Kye-Gwan Lee is the Assistant to the President of KNU. 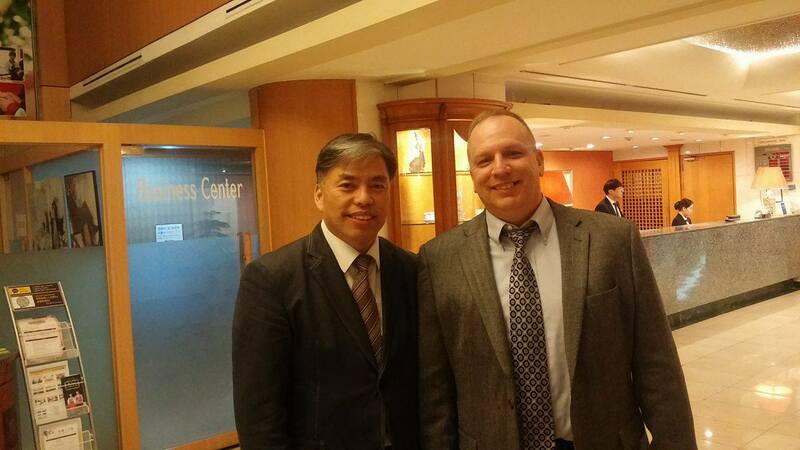 This is a picture of me and Pastor John Eun Yup Kim when we first met for coffee soon after I got to Korea. I wish I would have gotten a picture with him the day of the district assembly (we were dressed nicer!). He did so much to help me get there (and home) and took care of me throughout the day along with Dr. Graves and Rev. Louw and their families. I’m really glad we met! It is my honor to represent the Church of the Nazarene as a chaplain in the United States Army. It is my privilege to serve the Army and my church in the Land of the Morning Calm. It is my joy to be here today with fellow Nazarenes, brothers and sisters in Christ. While we do not share a common language or culture, we share a common Savior and Lord. I am truly blessed to be with you here today.